JERUSALEM – His All-Holiness Ecumenical Patriarch Bartholomew, spiritual leader of over 300 million Orthodox faithful worldwide, met today with Pope Francis on the Mount of Olives. At the site known as Viri Galilaei (Acts 1.11), the Patriarch and the Pontiff met for the third and final time during their joint pilgrimage to Jerusalem and the Holy Land. It marked the conclusion of an historical pilgrimage and fraternal encounter. With the echo of Paschal hymns in the distance, the two world leaders conferred on a variety of issues, including ecumenical dialogue, environmental ethics, interfaith relations, and religious freedom and human rights. They sealed their pilgrimage and fraternal exchange by reaffirming their commitment to advance peace, dialogue and mutual understanding among all people of the world. This Apostolic Pilgrimage commemorated the fiftieth anniversary of the meeting of their predecessors, Pope Paul VI and Patriarch Athenagoras in 1964, the first time an Ecumenical Patriarch and a Pope had met in over five hundred years. That historic encounter led to the Lifting of the mutual and limited Anathemas (December 7, 1965). 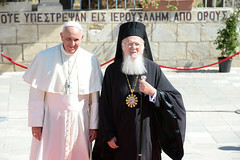 His All-Holiness Bartholomew is the Archbishop of Constantinople-New Rome and the Ecumenical Patriarch. He is the 269th successor to the First-Called Apostle Andrew, the founder of the 2,000-year old local Christian Church of Constantinople. The Ecumenical Patriarch is a living witness to the world of Orthodoxy's painful and redemptive struggle for religious freedom and to the innate dignity of humankind. As a citizen of Turkey, His All-Holiness' personal experience provides him a unique perspective on the continuing dialogue among the Christian, Islamic and Jewish worlds. He is known throughout the world as the "Green Patriarch" for his groundbreaking environmental initiatives and ecological theology. For his inspiring efforts on behalf of religious freedom and human rights, Ecumenical Patriarch Bartholomew was heralded as a Bridge Builder and Peacemaker and awarded the Congressional Gold Medal by the U.S. Congress in 1997.